LeftyBassist.com • View topic - Converting right handed basses for playing lefty. Converting right handed basses for playing lefty. Post subject: Converting right handed basses for playing lefty. Thought this might make for an interesting thread...or not. 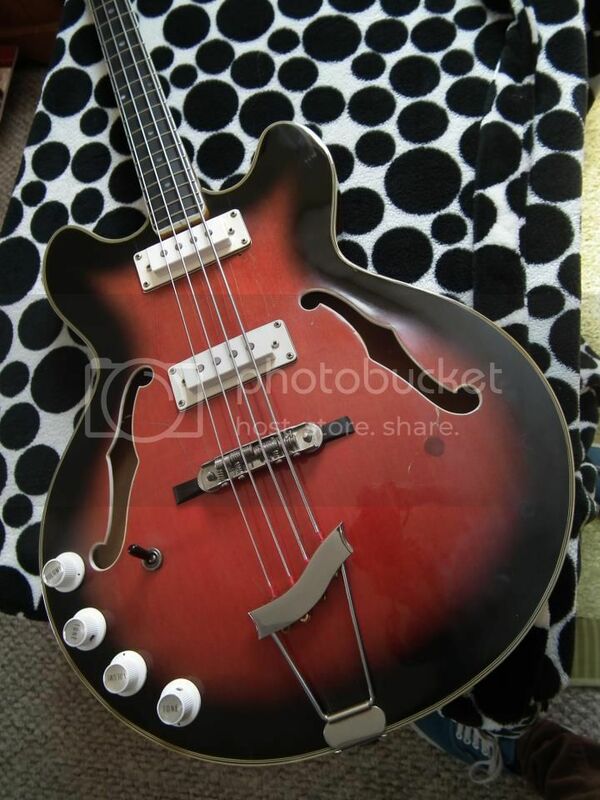 Do you own any right handed basses that you converted? There are the many issues, of course; the bridge, nut, control location, balance, etc. Any particular models that worked out really well, or really badly? For myself, I spent years pining for a single coil Precision/Telecaster bass. I've seen 1 true lefty Tele-bass for sale but at 10K...no dice. As far as I know, Fender/Squier has never made any lefty versions of their various single coil P/Tele bass re-issues. Then I saw a picture of Keith Ferguson (of the Thunderbirds) playing a converted right handed Tele and it looked pretty comfortable and well balanced for him. Around the same time Squier introduced their right handed Classic Vibe single coil P at a very reasonable price. I took the gamble and it paid off. The bass converted easily and handles quite well as a lefty, all things considered. I find the controls are not in the way, balance and body shape is acceptable. A couple of years later I scored a right handed Fender Japan "Blue floral/Paisley" single coil reissue P and it has worked out even better as a lefty than the Squier. Last edited by ADSR on August 25th, 2015, 9:48 am, edited 1 time in total. Post subject: Re: Converting right handed basses for playing lefty. 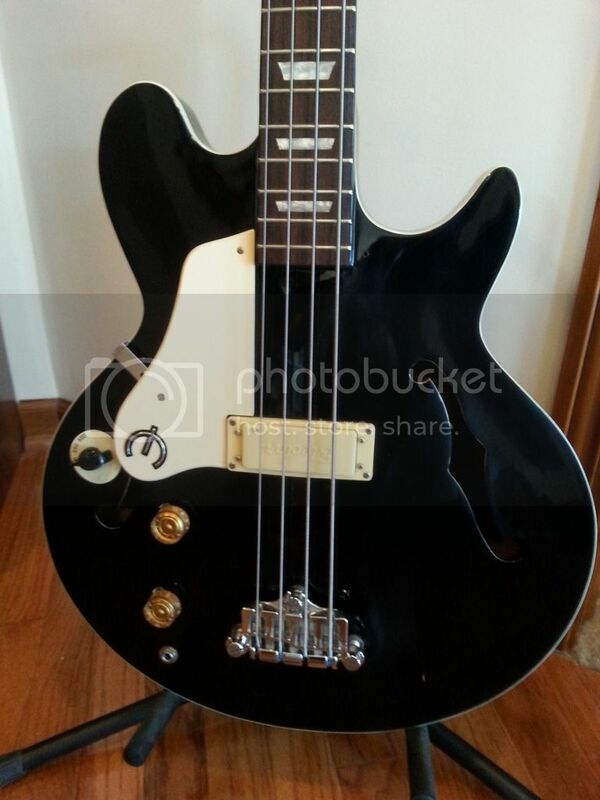 I've got this Electra bass for offer up (local sales app) for 65 bucks and paid 40 for the Gibson case, according to the owner this bass is from 72 and it's been sitting in the storage for years. It plays really nice and i have no trouble with the knobs, very nice balance and super lightweight. The only problem is that the neck pickup is dead and the bridge pickup is very weak, i have to turn the amp louder than usual to hear it. Looking to replace pots and pickups. Any info about these basses? I've tried to look up any of these for sale but i only see different models. I actually did this with a late '60's Eko short scale hollow body. It was beat down and not worth any kind of "vintage money" anyway so I thought I'd make it more lefty friendly. I went the full nine yards and moved the controls - had it done professionally by the guy who does all the major work on my basses. I told him not to go too crazy. (If I wanted to spend more money he would have spent the time to completely hide the old control holes.) Because of where the controls were located - right at the edge of the body - it was almost impossible to play without hitting them. It's a keeper for me now! Squire Classic Vibe P and the Fender CIJ Blue Floral P.
Love those single coil Ps! Don't the controls dig into your arm when playing though? Oh, man! I just love Lake Placid blue with a maple fretboard. I have 3; but, 2 of them haven't been converted yet. Kind of on the tail end of my "To Do" list. 1. An Epiphone EA-260. It shouldn't be too hard, but to do it right, I think the top should come off. And I haven't decided if it should stay red (not my favorite color) or have it refin'd in black. But, my companion EA-250 guitar (which is a lefty), is red, too, like all the EA's are. So, we'll see..
Why bother converting a righty Tele P when you can have one that was built lefty from the ground up?